Don’t you wish you had an assistant that could help you around the house? They’d keep track of your schedule, answer your questions, and control the room’s temperature, all without ever lifting a finger. With advancing technologies, companies such as Google and Amazon are trying to make this dream come true so you can relax and focus on the bigger picture of enjoying life. At Seamgen, we understand the importance of a healthy home life and believe home automation and the Internet of Things (IoT) will become an increasing part of everyone’s home experience. Whether we notice it or not, IoT is becoming ingrained in our daily lives at work, home, or even out with friends. IoT is beginning to transform the environment around us, but what exactly is the Internet of Things, and how is it able to function without us noticing? The term “Internet of Things” was invented by Peter T. Lewis in 1985 when he referred to the concept as an interconnectedness of technologies, able to collect data and utilize it for manipulating its surroundings. Ever since the introduction of IoT, the technology industry has seen exponential growth in creating sensors and devices that collect unique data to transform reality. There is a certain process to achieve interconnectedness. It starts with the objects you have sitting around your household—ranging between thermostats, music speakers, or a refrigerator. When these simple appliances have sensors compatible to the IoT platform, they are able to collect huge amounts of data—such as the music you enjoy, the room temperature you like, or what food you should buy at the grocery store. With the data collected, the sensors send the information to a secure IoT cloud-based platform where it is organized and analyzed. After the analysis, the IoT cloud platform sends back information to the devices, allowing these appliances to further predict your tendencies and preferences—eventually predicting what you want before you even know you want it. Although the full concept of IoT is a work in progress, companies such as Google and Amazon are making incredible strides in creating technology surrounding the idea. In 2014, Amazon released its ground-breaking technology, Amazon Echo. 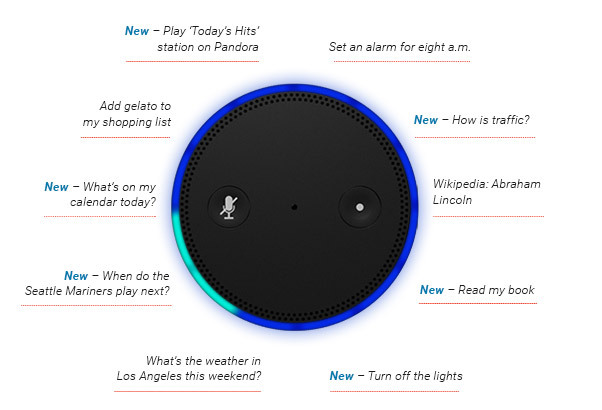 With this voice-command driven device, owners of Alexa can ask “her” to complete a variety of different tasks. The Alexa owner can grant permissions to a variety of web services for Alexa to leverage in the conversation—Spotify, Pandora, financial apps, etc—and a variety of bluetooth devices such as Philips smart bulbs. Alexa can play any song you want, control the temperature and room lighting to your liking, and answer any questions you may have, such as what the weather outside is like. Just recently, tech giant Google announced they’re throwing their hat in the ring with Google Home. This device is very similar to Amazon’s Echo, with a few additional functionalities. 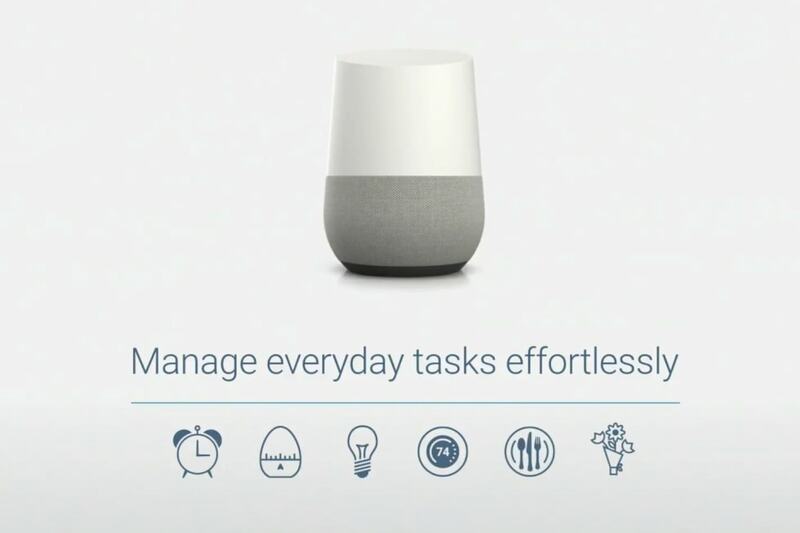 Google Home seamlessly syncs with the new Google phone, Pixel, along with syncing your Google calendar and Gmail account to better understand your schedule. Although Amazon has a two-year head start in the home automation industry, many technology experts and critics believe that Google will soon become the leader—as Google already has advanced hardware and software algorithms in their existing products. Big companies like Google and Amazon have made considerable advances, with profound amounts of innovation and creativity. There is still the opportunity for smaller companies to contribute to this ecosystem of devices, as the connected home market still has plenty of innovation potential. For example, a new startup, Notion, provides a wireless home monitoring system, even if you’re only renting your place. It keeps track of the people that are coming and going along with if you left any lights on or doors open. Now, if you don’t remember if you turned off the lights, the Notion sensors will be able to tell you straight from your phone. Although Google Home and Amazon Echo provide us with a glimpse of the future, they are still surrounded with initial developments in the technology of machine learning, speech recognition, and artificial intelligence. Imagine being able to walk into your home with a thermostat that adjusts automatically. Imagine if the device’s biometric scanners recognized you had a stressful day at work, playing soothing music after you walk in the door. There are many new and exciting opportunities that surround the idea of Internet of Things , and we, at Seamgen, are excited to see where the future will take us. Enjoyed this article on home automation? We have several more where that came from. Check out a few of our other, recent posts below.